BACKGROUND: Chronic obstructive pulmonary disease and lung cancer are diseases associated with smoking tobacco cigarettes. Smokers find cessation difficult. OBJECTIVES: To determine whether smoking the Twisp electronic cigarette (e-cigarette), containing nicotine in a vegetable-based glycerine substance, would reduce carboxyhaemoglobin (COHb) levels in regular cigarette smokers by (i) comparing arterial and venous COHb levels before and after smoking the Twisp e-cigarette for 2 weeks; and (ii) evaluating changes in participants' perception of their health and lifestyle following the use of Twisp e-cigarettes. METHODS: A single group within-subject design was used where tobacco cigarette smokers converted to Twisp e-cigarettes for 2 weeks. Prior to using the Twisp e-cigarette and after using this device for 2 weeks, arterial COHb, venous COHb and venous cotinine levels were determined. Additionally, the participants were asked to complete a questionnaire outlining their perceptions on health and lifestyle. RESULTS: Thirteen participants of median age 38 years (range 23 - 46) with a smoking median of 20 cigarettes/day (range 12 - 30) completed the study. 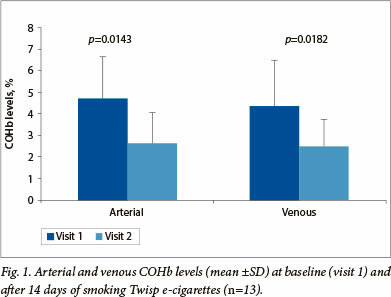 COHb levels (%) were significantly reduced after smoking Twisp e-cigarettes for 2 weeks (mean ± standard deviation (SD) arterial COHb before 4.66±1.99 v. after 2.46±1.35; p=0.014 and mean ±SD venous COHb before 4.37±2.1 v. after 2.50±1.23; p=0.018). There was excellent agreement between arterial and venous COHb levels (intraclass correlation coefficient 0.916). A decrease in cotinine levels (p=0.001) and an increase in oxygen saturation (p=0.002) were also observed. The majority of participants perceived improvements in their health and lifestyle parameters. CONCLUSION: Smoking the Twisp e-cigarette may be a healthier and more acceptable alternative to smoking tobacco cigarettes. Chronic obstructive pulmonary disease, lung cancer and numerous other diseases are associated with the smoking of tobacco cigarettes (cigarettes). Over 7 000 chemicals are present in cigarette smoke. Sixty-nine of these are considered to be carcinogens, whereas another 400 are toxins including tar, nicotine and carbon monoxide (CO). Nicotine is the addictive agent that results in rapid central dopamine release during smoking and renders smoking cessation difficult. The average cigarette contains 6 - 10 mg of nicotine, of which 1 mg is absorbed into the blood. Nicotine has a short half-life (2 - 3 hours) and is rapidly metabolised by the liver into cotinine (half-life 16 - 18 hours). Elimination of cotinine is prolonged after complete cessation of nicotine exposure. It may take up to 7 - 10 days for cotinine blood levels to be undetectable. Serum cotinine levels thus provide a reliable measure of exposure to nicotine over a period of 2 - 3 days. CO, a product of tobacco combustion, binds with haemoglobin (Hb) to form carboxyhaemoglobin (COHb) which deprives Hb of its oxygen-carrying capacity. In non-smokers the proportion of COHb is generally <2%, but is dependent on environmental exposures to car exhaust emissions, pollution and passive smoking. In active smokers, COHb levels can range from 2% to 15%. A study done at the Bronx hospital, USA, found that venous or arterial COHb can be used to diagnose CO poisoning in emergency units. CO levels in cigarette smoke and the vapour produced by the Ruyan electronic cigarette (e-cigarette) demonstrated that smoking the Ruyan e-cigarette did not raise exhaled CO levels. E-cigarettes are marketed as being less harmful to health than cigarettes. Concern has been raised about the substances present in the vapour of some e-cigarettes. Propylene glycol (PG), which makes up 90% of the liquid that is vapourised in some products, was believed to be possibly carcinogenic. However, in a recent study, no evidence was found that PG is a carcinogen. The Twisp eGo e-cigarette (Twisp e-cigarette) range does not contain PG, but rather a vegetable-based glycerine liquid carrier for the nicotine. These have been registered by the South African Medicines Control Council as both a Virginia tobacco- and a cherry-flavoured liquid. The Twisp eGo cartridge has a capacity of 0.8 ml containing 0.0144 mg of nicotine. The e-cigarette is battery-operated and releases nicotine-containing vapour instead of smoke. Several brands of e-cigarettes exist with the Twisp being the first marketed in South Africa (P Bartholomew, Twisp SA, personal communication, 22 September 2010). Twisp e-cigarettes were used in this study. 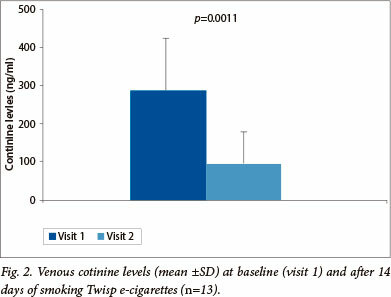 To (i) determine the effects of the Twisp e-cigarette on arterial and venous COHb levels, cotinine levels as well as the agreement of these two COHb measures, before and after smoking the Twisp e-cigarette for two weeks; and (ii) evaluate participants' perception on whether their health and lifestyle changed with the use of the Twisp e-cigarette and whether this intervention would motivate participants to reduce or quit smoking. A single group within-subject design was used where participating cigarette smokers converted to smoking the Twisp e-cigarette. Fifteen participants aged 18 - 50 years, smoking 10 - 30 cigarettes per day, and with no known history of lung disease, were recruited from 1 Military Hospital, Pretoria. This study was approved by the Student Research Ethics Committee of the Tshwane University of Technology and the 1 Military Hospital Research Ethics Committee. The participants exchanged their cigarettes for the Twisp e-cigarette and were instructed to smoke this exclusively for a period of two weeks. Participants were evaluated at baseline prior to using the Twisp e-cigarette (visit 1) and again after two weeks (visit 2). At each visit, blood pressure and pulse were measured with an electronic vital signs monitor. Both arterial and venous COHb and oxygen saturation blood samples were analysed using an Ilex Premium 3000 Blood Gas Analyser. Serum cotinine was measured using chemiluminescent detection. The participants completed a questionnaire on their perception of smoking cigarettes and the Twisp e-cigarette at each visit. The sample size was calculated based on before- and after-intervention arterial COHb (%) levels; a sample of 11 smokers would give the study a 90% power. Fifteen participants were recruited to allow for potential drop-out. Data summary for the smoking parameters arterial COHb (%), venous COHb (%), cotinine (ng/ml) and oxygen saturation (SpO2 (%)) was performed using the descriptive statistics of mean, standard deviation (SD) and 95% confidence interval (CI). Before v. after intervention results were compared using Student's paired t-test with p<0.05 being considered significant. The agreement between arterial and venous COHb (%) levels was assessed using the intraclass correlation coefficient (ICC). Fifteen smokers of median age 38 years (range 23 - 46) were recruited. They were heavy smokers with a median daily cigarette consumption of 20 cigarettes (range 10 - 30). The participants were long-standing smokers, median 17 years (range 5 - 27) and spending a median R700 per month (range R400 - R1 000) on cigarettes. Thirteen participants (8 male, 5 female) completed the study. Of the 2 participants who did not complete the study, 1 participant felt ill on the fourth day, experiencing headaches and fever, possibly due to tobacco withdrawal symptoms. The other drop-out went on a military course and experienced much stress and exposure to passive smoking and therefore found it difficult to abstain from cigarettes. 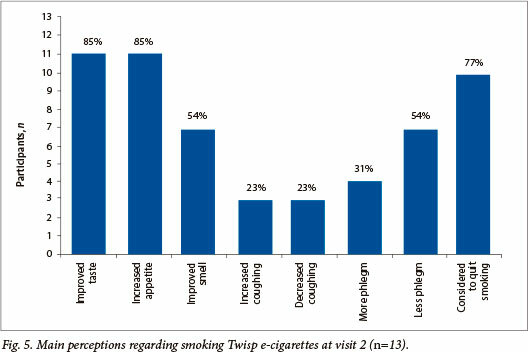 Table 1 compares cigarette smoking with 14 days of Twisp e-cigarette smoking with respect to the smoking parameters. A significant improvement after 14 days of e-cigarette smoking was observed for all parameters: arterial COHb (mean reduction 1.95%; 95% CI 0.47 - 3.44; p=0.0143), venous COHb (mean reduction 1.87%; 95% CI 0.38 - 3.36; p=0.0182), cotinine levels (mean reduction 190.24 ng/ml; 95% CI 94.65 - 285.83; p=0.0011) and SpO2 (mean improvement 1.34%; 95% CI 0.60 - 2.08; p=0.0020). Arterial and venous COHb were measured and compared at each time-point. A significant improvement after 14 days of Twisp e-cigarette smoking was observed for both parameters (Fig. 1). COHb can be measured using arterial blood or venous blood, with arterial blood being preferred. However, the venous reading requires less skill and holds fewer risks for the patient. In this study, an excellent agreement for the two methods were observed for both cigarette smoking at baseline (ICC=0.895) and after 14 days of Twisp e-cigarette smoking (ICC=0.873). Arterial SpO2 measured at baseline was 96.15% (95% CI 95.1 - 97.2) and improved by a mean of 1.34% (95% CI 0.6 - 2.08); p=0.002. There were no significant changes in the blood pressure and pulse rate from baseline to day 14. The mean ±SD cotinine level at baseline was 287.25±136.05 ng/ml and was significantly lower at day 14 (97.01±80.91 ng/ml) (Fig. 2). At visit 1, a 'Perception on Smoking Tobacco Cigarettes Questionnaire' was completed by the participants demonstrating the following: time taken before first cigarette is smoked in the mornings, reasons and triggers for smoking and the cigarette brands smoked (Fig. 3). More than half of the participants (53%; n=8/15) had a cough and of those, 63% (n=5/8) had a productive cough (Fig. 4). Activities the participants associated most with smoking were eating (n=13/15), alcohol consumption (n=9/15) and drinking coffee (n=5/15). At visit 2, a 'Perception on Smoking the Twisp E-cigarette Questionnaire' was completed by the participants and the following main symptoms were found (Fig. 5): after 2 weeks of smoking Twisp e-cigarettes, significant improvements were noted, especially in taste and appetite (n=11/13; 85%), smell and less phlegm (n=10/13; 54%) and 10/13 (77%) participants considered stopping smoking (Fig. 5). Over a 2-week period after the participants exchanged their cigarettes for the Twisp e-cigarette several physiological, biochemical, health and lifestyle parameters improved. These may be attributed to the Twisp e-cigarette providing only vapourised nicotine at a very low concentration with none of the other gases and particles normally associated with tobacco combustion. The reduction of CO levels in exhaled breath as described by Laugesen et al. is confirmed by the arterial and venous COHb data (Fig 1). Furthermore, we showed that venous COHb correlates well with arterial COHb. Venous COHb may thus be a reliable alternative to arterial blood in cases of CO poisoning. Our data further support the findings of a study done at the Bronx hospital showing that venous and arterial COHb correlate well. 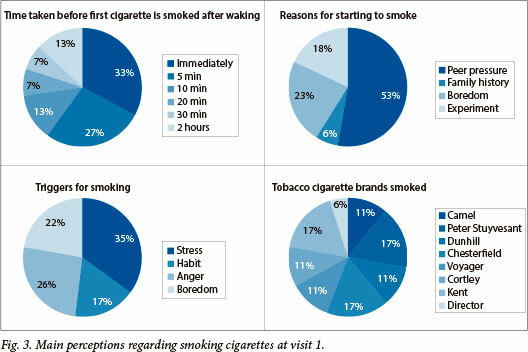 Of the 15 participants recruited, 11 smoked their first cigarette of the day immediately or within 10 minutes on waking (Fig. 3), which would suggest high nicotine addiction. This is supported by the high cotinine levels at baseline. Over the 2-week period, cotinine levels were significantly decreased, reflecting reduced nicotine intake (Fig. 2). Nicotine withdrawal symptoms were not specifically asked for, but given the general improvement in health-related parameters, it is unlikely that the participants experienced significant withdrawal. Of the 15 participants, 8 experienced coughing symptoms and of those, 5 had a productive cough (Fig. 4). The main activities associated with smoking were, after eating, consumption of alcohol and after drinking coffee. The majority of participants showed an improvement in their health parameters (Fig. 5). Out of the 13 participants who completed the study, 11 had improved sense of taste and increased appetite followed by improved sense of smell (n=7). Less phlegm was experienced in 7 participants while 4 experienced more phlegm; the latter may not be a negative finding, but may reflect damaged cilia regaining function in the airways. The majority of participants enjoyed improved lifestyle parameters: less smelly breath, clothes and ashtrays; cost savings for cigarettes; and increased productivity at work. Ten participants considered quitting smoking after smoking Twisp e-cigarettes and eight bought the Twisp e-cigarette with the aim of either smoking less or quitting smoking. One participant who decided to stop smoking did not find it necessary to purchase the Twisp e-cigarette. According to Eissenberg, several smokers reported using the e-cigarette as a method for tobacco cessation. The original version of the Twisp was associated with liquid leaking into the mouth, as experienced by 7/13 participants in this study. This was attributed to overfilling the liquid cartridge and sucking too hard when smoking. Newer Twisp e-cigarette models are made to prevent this and, additionally, have a longer battery life. The possible limitations of this study were the small sample size and inability to monitor participants smoking of cigarettes beyond measuring cotinine levels as a nicotine biomarker. Participants' cotinine levels were, however, low. Furthermore, participants were not instructed to avoid passive smoking, as it was debatable whether passive smoking could have been avoided in the normal working and social environment. Our results suggest that Twisp e-cigarettes may be a healthier and more acceptable alternative to cigarettes, at least in the shortterm period of this study. E-cigarettes may be an aid to smoking cessation and/or a healthier alternative to tobacco smoking. Longterm safety and efficacy studies are required to confirm these findings in South Africa. Acknowledgements. We are grateful for the sponsorship of the eGo e-cigarette packs by Twisp and also for the valuable advice and laboratory assistance given by Col. (Dr) J Lubbe, Chemical Pathologist, 1 Military Hospital, Pretoria with regard to the measurement of the cotinine levels. We also wish to acknowledge Professor Martin Veller for his insightful contributions during the preparation of this manuscript and also Dr Richard van Zyl-Smith for his assistance and review. Conflict of interest. The sponsor of the Twisp e-cigarette had no role in the design and conduction; the collection, analysis and interpretation of the study; or in the preparation, review or approval of the manuscript.